Pressofiltro® pilot units are multipurpose tools for pilot plant or laboratory applications as well as for small scale production facilities. Versatile use of the equipment, cGMP compliant design, containment, efficient and complete cleanability, complete discharge-ability, highest drying efficiency, process safety and monitoring, ease of validation and a compact design are important requirements for this type of equipment. Pressofiltro® pilot nutsche filters and filter dryers designed to meet varied customer specifications. Customer specified options include single column support, support on a skid or conventional 3 leg design, hydraulically activated discharge valve or manually operated discharge port, active or passive isolators for sampling, product pack-off and heel removal, heel removal systems, microwave duty preparation, all electric versions, bayonet or C-clamp locking for filter bottom, etc. Prior to feeding slurry into the agitated Nutsche filter or filter dryer the vessel interior is inerted by a controlled displacement of the oxygen containing atmosphere with Nitrogen. This procedure prevents the potential formation of an explosive atmosphere in the vessel interior. After inertization is completed the slurry is fed into the vessel. The slurry is filtered by pressurizing the vessel interior using Nitrogen and/or evacuating the area underneath the filter plate. 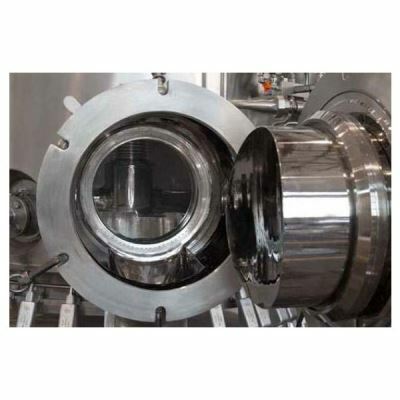 Solids are retained by the filter cloth whereas the mother liquor passes thru the filter cake forming and thru the filter cloth and is discharged from the area underneath the filter plate. Once the mother liquor has been filtered off the cake washing step is initiated. Prior to displacement washing the filter cake surface is smoothed using the agitator to prevent cracks in the filter cake. The washing liquid is evenly distributed over the entire filter cake surface using a wash ring with spray nozzles. By again pressurizing the vessel interior the washing liquid is forced thru the filter cake, displacing any remaining mother liquor and is discharged the same way as the mother liquor during the filtration. In the reslurry washing process the washing liquid is added to the vessel and mixed with the filter cake using the agitator. By again pressurizing the vessel interior the washing liquid is forced thru the filter cake, displacing any remaining mother liquor and is discharged the same way as the mother liquor during the filtration. After completion of the washing process the drying process is initiated. For efficient drying the filter dryer is typically evacuated in steps and heated up at the same time. During the drying process the product is agitated. The filter dryer is maintained under vacuum and at the maximum allowable temperature for the product until the final required product humidity level is reached. 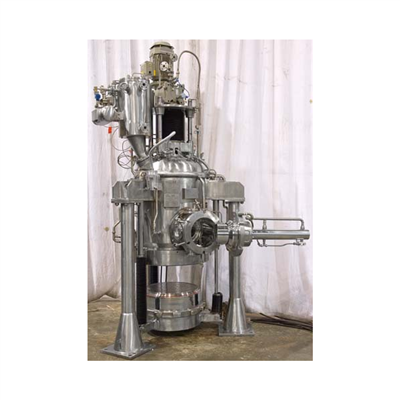 The dried and cooled product is discharged thru the side discharge valve. 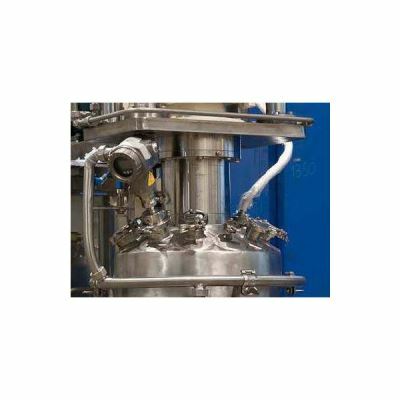 The product is transported to the discharge valve or thru the side discharge port into the isolator using the agitator. Using spray balls a cleaning fluid is sprayed onto all product wetted internal surfaces for the internal cleaning of the equipment in between individual batches or for product change over. This provides for full and efficient cleaning of the filter dryer interior.